At UniTorq we understand the important role actuators play in the production process and how costly downtime can be. This is why we have prioritized providing products that meet the highest standards in engineering and quality. Our product line of pneumatic actuators is built to withstand the harshest environments and function reliably, reducing the risk of work stoppage. M-Series pneumatic actuators are made from the highest quality materials and designed to withstand the toughest environments. 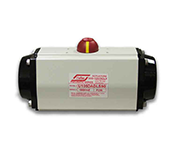 A-Series pneumatic actuators feature a type 304 or 316 stainless steel body for rugged, reliable performance in harsh environments.